Bhagavathi Puja is a traditional procedure involving the drawing of the Padmam, Avahanam and Pushpanjali with recital of select Mantrams. Carrying out this Seva is considered very beneficial and can ward off the ill-effects of Chandra, Sukra, Kuja and Rahu. Padmam drawing requires a lot of diligence and represents nature in its five elements. 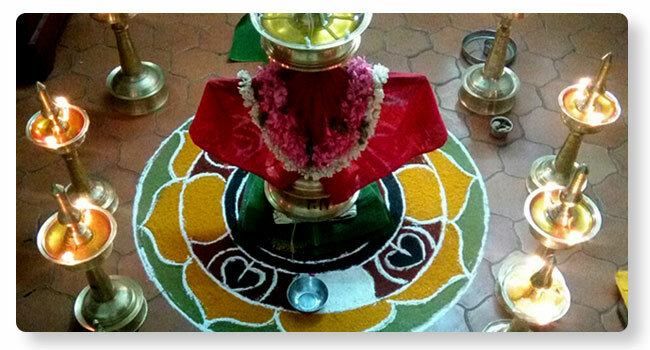 Ashtottaram, Sahasranamam, Devi Mahatmyam are chanted. For getting right suitors, Mantrams like Jayadurga Mantram, Vanadurga Mantram, Ashwaroodam, Thrushtap are performed for various Pushpanjali. Also the recital of Santanagopala mantram (to ensure birth of a good child) is carried out and Naivedyam of unsweetened Palpayasam (a traditional preparation) is offered. For Prosperity, divine grass dipped in Trimadhuram is used for Ahuti with recital of Bhagyasuktham (for removing obstacles and get things cleared). For land related issues, Bhagyasuktham homam is performed with lotus bud dipped in butter. Other offerings include Modakam for fulfilling desires. Avoids negative connotations of planets.